On Tuesday morning I took my tangly toys and went to breakfast with the purpose of learning Rick Roberts' new tangle, Assunta. Learning this tangle was the Diva's Zentangle challenge for week #36. SO... I got away from my phone, sat on a cool and breezy patio, ordered my breakfast, and began to follow the tangle's steps that were illustrated in the Zentangle newsletter. I followed the steps, trying not to 'figure out' the structure. That was a little tough. Part of my brain wanted to understand what I was doing, so I could do it RIGHT! But there was a deeper part of me that nudged me to let that go and just trust the structure that I saw on the paper in front of me (I had printed out the diagram from the newsletter). It was still a little daunting, as I lost my bearings once my initials little nicks were gone, but again, I looked at the diagram for my map, trusting that the road really would take me to the end. And it did. Once I turned down the voice of control in the left side of my brain, the voice of beautiful unreason in the right side became loud enough to follow, and to trust what my eyes were seeing. I did a couple tiles before I got really comfortable with the structure and eventually, a sort of rhythm came around. I naturally worked small when I first began, and by the time I was ready for a third tile, I wanted to get into a bigger scale. I couldn't resist adding Puf to the spaces between the drop shapes, so having a larger scale would make that easier. This tangle reminded me of Cadent, and so my third tile included that as well, also all "Puf-ed" out. So much fun, especially the shading. That's when all the shapes emerge and things start asking to be out front or behind. I love that in Zentangle, you can decide what to shade and what not to. Because it's just a shape, and not a representational rendering of something real, like an apple in the sunlight, it doesn't matter where you put your shading. 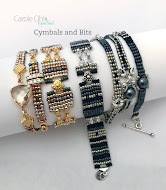 I love the new Assunta tangle – thank you, Rick! And thanks to Maria for inspiring such a treat. If you read the newsletter, you will get the story on that! Thanks, Laura for another fun weekly challenge! Last week I visited my favorite breakfast spot for a little quiet time away from my computer. Amicis has awesome Chai Spiced Oats and it was a cool, lovely morning on the restaurant's patio. As I always have Zentangle tiles and Micron pens in my purse, after I ordered my oats, I pulled out my goodies and joyously tangled a tile. It was such a sweet experience, I decided to make it a weekly ritual. If I did it on Tuesday, the Monday mayhem would have passed, and I could settle into the Diva's challenge, or play with a newly discovered tangle. I put the word out on Facebook to the local Zentangle lovers. I figured, even if no one could join me, I would still be happy to sit and tangle all by myself. Today was the first "official" Tuesday Tangle Breakfast. I had one tangle buddy appear (thanks for the great company, Tammy! ), and the morning was cool and sunny. 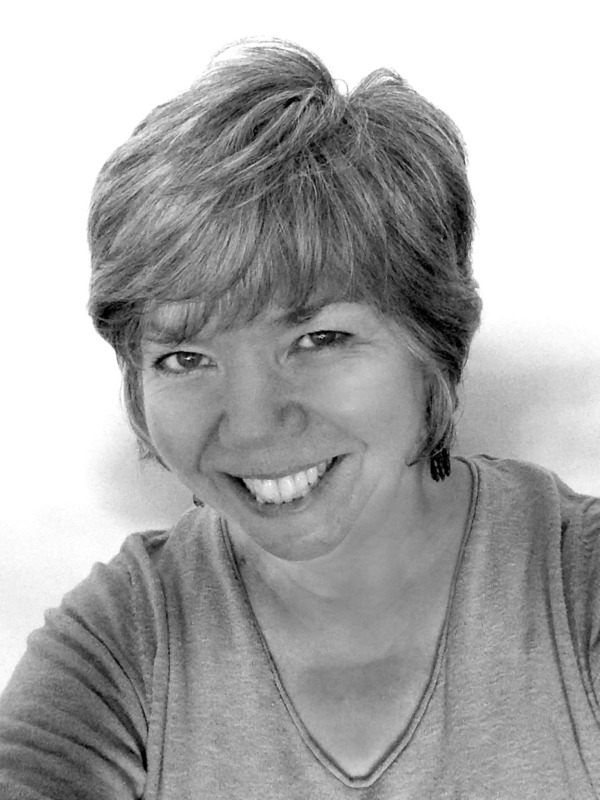 I had a great time sinking my pen into the new tangle, Assunta. Once my right brain wrapped around its structure, my pen didn't want to stop. Of course, the breakfast wrap I ordered tempted the pen down, but I can't wait to tangle more later today. One of the things I love about the art of Zentangle, is its flexibility. Whether by yourself, or in a group of others (even if they aren't tangling), it's unobtrusive and relaxing, no matter where you are. I'm looking forward to next Tuesday. Thanks, Zentangle, Amicis, and Tammy! Margaret Bremner, a fellow CZT, brings us this week's Diva Challenge (number 35!). She invited participants to first create a string that included a small square with a large border, then add a string to that. It creates a very orderly tile, with wild things happening in the space between the strings. I thought, since things have been busy round these parts, I would only do one this week. And I felt like I was cheating a bit by using two colors to define the difference between the tile and the border. But I kept reminding myself that the challenge and its "rules" are really just suggestions, just like the string itself is a suggestion; rather than something that binds my decisions, the challenge gives me the groundwork to jump into realms not yet discovered! So, while letting myself have so much fun, two tiles came about. Just in case you haven't seen Suzanne McNeill's new book, it's here! Suzanne McNeill, CZT, has once again put together a wonderful collection of Zentangle inspired mandalas that will inspire you to get out your art goodies and get busy. As always, there are new tangles and new ways of looking at the art of Zentangle. And color? Lots of color! She also covers the symbolic aspects of the colors and shapes used in mandalas. I am very grateful to be included in the book, along with my fellow CZT, Margaret Bremner. Her beautiful work graces the cover of the book, and there are more of her goodies inside, as well. I've been a fan of Margaret's work since we met at the CZT training seminar in May, 2010. I remember looking at the show'n'tell table, thinking... "I really want to meet this Margaret Bremner person!" I finally did meet her on the second day, and little did I know we would be sharing space in a book one year later. I love the tangles of this life, and the strings underneath. Thank you, Rick and Maria for being the string!! I hope you all add this book to your stash (as I know most of you have every Zentangle inspired book that comes out! 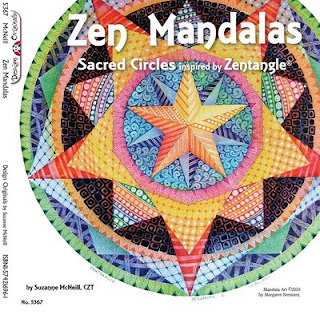 ), and find the inspiration and gifts that a mandala, especially Zentangle-style, can bring. Thank you Suzanne, Rick, Maria and Margaret. Words just don't come around some days. But there is always a Zentangle to say things in ways that words never can. It's always fun when a new tangle comes to town. This week, the Zentangle newsletter offered a tantalizing new tangle treat called Pendrills. And always on top of her game, Laura Harms (aka the Diva) offered the challenge to use it this week. I love how this simple shape can grow and twist or simply slide across the page in a straight line. It can go behind, which is one of my favorite things, or stay flat, or end in a curly fashion, or not. Amazing how a couple of simple lines and swirls can have so much to say! Thanks, Maria, Rick, Laura, and the lovely grapevine! For special pricing on ten or more Tangle-a-Day calendars, click here.